The images in this post are somewhat disturbing, so be warned. Miraculously, all of the patients in these x-ray’s survived, with most making complete recoveries. 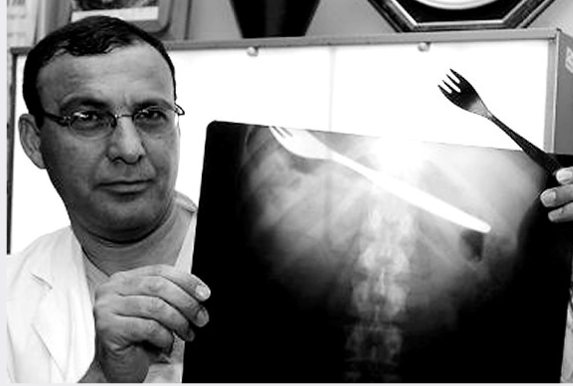 This x-ray shows the stomach of an Israeli woman who swallowed a fork while trying to catch a bee that flew into her mouth. A schoolboy archer in China had an narrow escape after being shot with an arrow through the eye by a classmate. This poor fellow didn’t heed is parents’ advice about not playing with firecrackers. The x-ray of Ron Hunt’s skull shows an 18-inch-long drill bit that pierced Hunt’s eye socket and went through his head, just nudging his brain. Hunt, a construction worker, fell off a ladder and landed on the drill he was using at a construction site. This X-ray shows a 3-inch nail in the head of a Houston carpenter. The nail missed half a dozen vital areas by an eighth of an inch. When this 12-week-old terrier was reluctant to curl up, his owner knew something was wrong and took him to get checked out. An x-ray revealed a seven-inch kitchen knife in his stomach. An X-ray showing a pair of surgical scissors in the abdomen of 69-year-old Pat Skinner in Sydney, Australia in 2004. Skinner had an operation in May 2001, but continued to complain of intense pain. it wasn’t until she received this x-ray 18 months later that the scissors were discovered. Six nails were embedded in the skull of construction worker Isidro Mejia, 39, after an industrial incident caused a nail gun to shoot nails into his head and brain on April 19, 2004. Five of the six nails, shown above in an X-ray from Providence Holy Cross Hospital, were removed in surgery that day, and the sixth was removed from his face on April 23, after the swelling went down. Yorkshire terrier puppy Charlie was rushed to the vet’s after getting a Xmas decoration lodged in his throat. An x-ray of 17-month old Nicholas Holderman, who fell on a set of car keys. Miraculously, he recovered completely within 2 months of the accident. These X-ray images show a teenage boy with a 5-inch knife was plunged into his head. He received the wound when trying to stop a friend from being robbed at the bus stop and was lucky to survive the wound after being rushed to the hospital in Walworth, south London, in November 2007. This poor guy was shot in the face at close range, but his nose stopped the bullet, saving his life.